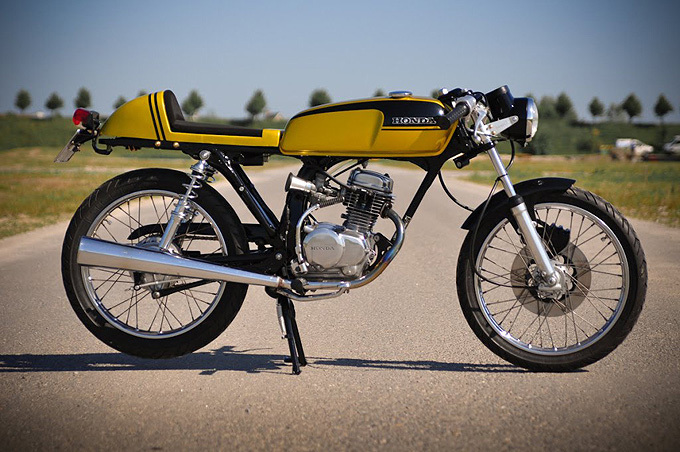 This beautiful little CB50J café racer was built by a Dutchman named Michel. Like many men before him, he realized he didn’t like the look of his stock Honda CB50J, so decided to turn it into a café racer. The jewel in the crown was finding that stunning NOS candy gold gas tank with black stripes. This vintage gas tank came new in a box from Honda spare parts specialist CMS in the Netherlands.